Quartz countertops are very resistant to stains because liquids cannot seep into the material. This makes cleaning easy because spills can be easily wiped from the surface. Quartz countertops are also non-porous and highly antimicrobial – something that’s very important where hygiene is a concern. Quartz mineral in its raw state is hard, therefore so are quartz countertops. They will blunt knives before they scratch the surface. Quartz is far more durable than laminate or solid surface countertops, both can scratch and show cuts easily. Quartz countertops are less likely to crack from impact than granite thanks to a resin that’s found between crushed quartz pieces. The resin is flexible and serves as a shock absorber that disperses energy from impact. Quartz countertops are very durable and are perfect for everyday kitchen wear and tear. 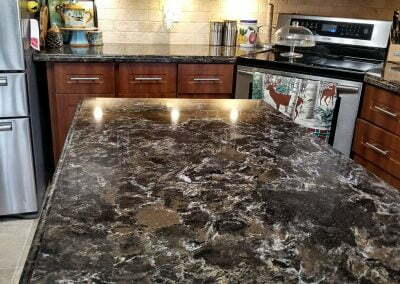 As man-made substance, quartz countertops are made from 90-95% quartz and 5-10% resins and binders. This combination creates an amazingly durable countertop without pores or cracks. Quartz is non-porous which means it will never need sealing. These countertops are stain-resistant and require little to no maintenance. However, quartz counters are not as heat resistant as granite countertops, so you should not set a hot pan down without something under it. Quartz countertops are very resistant to stains as liquids cannot seep into the material. This makes cleaning easy because spills and messes just glide off the surface. Quartz countertops are also non-porous and highly antimicrobial – something that’s very important where hygiene is a concern. Quartz mineral is hard and so are quartz countertops. They will blunt knives before they scratch. Quartz is far more durable than laminate or solid surface countertops, both of which scratch and cut easily. Unlike stone or wood, quartz countertops never need to be sealed. All you need to clean quartz is warm soapy water. Stubborn stains can be removed with a good scrub. We recommend you avoid scouring pads however, as they can dull the surface. Avoid cleaning products full of chemicals as well, as they can break down quartz and resin bonds. Compared to synthetic options such as laminate, quartz is relatively heat resistant. It will resist bending or warping if it comes into contact with hot objects. If you find burn marks on your quartz countertop, you can sand down the surface. This isn’t possible with solid surface or laminated countertops, which melt and must be replaced. Quartz costs about 15-20% less than granite but costs 50% more than solid surfaces and 250% more than laminate. Most quartz countertop owners find its durability, ease of maintenance, and hygiene benefits more than make up for its price. While great in a kitchen environment, quartz countertops aren’t the best choice for outdoor use. Quartz countertops will quickly fade from prolonged exposure to the elements. They are also more likely to get scratched. Quartz can be used outdoors, but granite, stainless steel, and concrete are all better choices. While quartz countertops will not melt and warp like laminate or solid surfaces countertops, placing a hot object directly on quartz may leave burn marks or discolouration. Most manufacturers say their quartz products can handle up to 200 Degrees Celsius, but a sudden change in temperature or sustained heat may cause the surface to crack. To be safe, always use a heat pad or cloth when resting hot dishes.